corrisponding with what is currently Strombolicchio. Today the mouth is only the neck, the eruptive duct solidified and is very resistant to the erosive sea. The current island emerged about 40,000 years later, which are still evident eruptive units belonging to the era of paleostromboli I and II. About 35,000 years ago, the vent moved to the north-west, the stratification of the emission of lava and pyroclastic rocks rose the cone to 700 m above sea level, this phase is referred to as paleostromboli III. 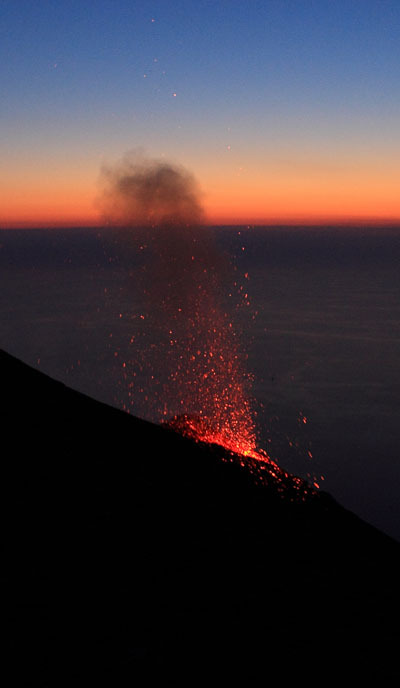 The history of Stromboli saw the series of events that led to the collapse and formation of various buildings, amoung these the erruptive complex of Scari that dates back some 34,600 years ago, where the frequent emission of lapilli etc can be observed. The geological stratification can easily be identified through the analysis of pyroclastic deposits that mark the phases of Stromboli. The Vancori complex, dates back to 26,000 years ago, is characterized by basaltic pyroclastic deposits and shoshonitics, this phase ended with the collapse of the north-west part of the volcano. The next stage sees the reformation in the northwest area that dates back to 13,800 years ago, and was called neostromboli. Simultaneously other erruptive vents gave origin to Timpone del Fuoco near Ginostra and to the lavas of San Bartolo and San Vincenzo. The north-west area suffered between 5,000 and 10,000 years ago, and another collapse changed the landscape, leaving a horseshoe-shaped dent that extends up to 2,000 m below sea level. This deep hole was filled by pyroclastic material and lava. Currently, the eruptive center is composed of three craters parallaly aligned on the top of the Sciara del fuoco. 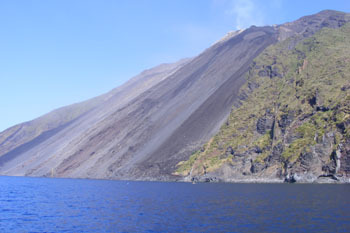 The recent eruptive activity of Stromboli can be divided into two distinct periods: the first from the IV – VII century, characterized by bursts with classic Hawaiian fountain eruptions, the second shows the same characteristics as the current one with bursts of medium- low intensity followed by the leakage of dark ash such activity occasionally takes the form of paroxysms, eruptive crisis of greater intensity with the emission of pumice and golden brown flows. The current activity takes place at 750 m height in the three craters aligned to Sciara del Fuoco, the morphology of these craters changes frequently because of violent explosions, with the subsequent migration of eruptive vents. The activity consists of regular explosions of medium-low energy lasting a few seconds at intervals of ten or twenty minutes. Emissions consist of bombs, lapilli, ash and blocks that rise from tens of meters up to several hundred. Periods of inactivity are very rare; between 1908 and 1910 there was registered the longest period of dormancy. The normal activity can be interrupted by bursts of greater magnitude defined as paroxysms, characterized by violent and sudden outbursts during which the launching of pumice, ash and stone blocks to reach considerable distances to affect residential areas. These paroxysms may cause the falling of material onto the slopes steeper triggering avalanches of debris documented during eruptions in 1930, 1944 and 2003. The lava flows, of which only twenty-eight were recorded in the last century, usually escape through the fractures of the eruptive crater within the area of the Sciara del Fuoco that continuously produces dark lava. Many oceanographic researches showed a large valley on the side of the volcano that extends to a depth of 2500 m.